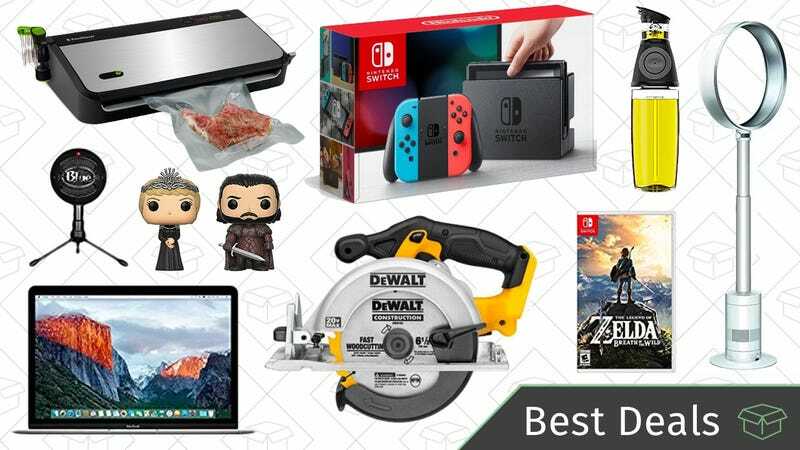 Finally get yourself a Nintendo Switch, dig through a DEWALT tools Gold Box, find a refurbished MacBook, and more. If you’ve been itching to get back outside and start cooking again, today’s Home Depot sale is for you. They have the popular ceramic Kamado grills, smokers, griddles, charcoal grills, and more, all up to 20% off. My pick would be the $254 Char-Griller Akorn Kamado Kooker, which features a 447 square inch cast iron cooking surface (which is most similar to the $1200 extra large Big Green Egg), and traps heat inside a heavily-insulated stainless steel body. This sale will only last through the end of the day, so grab what you need before the sale goes up in smoke. Waste King makes some of the most highly rated garbage disposals on Amazon, and this 1/2 horsepower model is down to $49 in today’s Gold Box, the best price since 2010. I’m not sure how powerful half a horse would be, but reviewers seem satisfied to the tune of a 4.3 star average. Yes, Marc Jacobs makes clothing, but the brand also has a pretty stellar beauty line. I personally own mascara, eyeliner, and lipsticks from Marc Jacobs Beauty and can attest to how great they are. I also have almost a dozen of the nail lacquers and right now, they’re giving you 50% off all nail colors, including Limited Edition colors, with the code MJBNAILS.